lady vs. food: the journey of an aspiring meat artist. Half of a lamb was hanging from a hook and I was holding the knife. I looked down at my hands accusingly, as I smeared blood on my extra small-sized butcher jacket. How the hell did I get here? I am a post-vegetarian. Wait, don't stop reading. I'm not going to get up on my salami box and force my bloodthirsty agenda down your throat. This is simply my story. It just happens to be about a girl who formerly lived off soy sausages and faux-chocolate dipped protein bars making the decision to pursue recreational butchery. After sharing a backyard with a spotted cow in Ireland while studying abroad during college, I looked into Betty's big brown eyes and on a whim, promised I would no longer eat her or her family. And I didn't, for quite some time. During my vegetarian stint, I tried with all of my might to justify my dietary choices, but my pity for Irish cows often fell short. I heard the words come out of my mouth, “Raw meat is gross; I feel so much healthier; beans with rice is the perfect meal for a frugal single girl…” But I often found myself imagining little-girl me sneaking the spicy-sweet sausages out of my mom's pot of simmering spaghetti sauce. My life was meat-free for six long years. Then my tired, anxiety-ridden, iron-deprived body gave in. My throat tightened at the sight of my staple salted nut snacks, stomach lurched when presented with yet another spinach salad. My favorite tofu coconut Thai take-out landed me hacking and wheezing to Urgent Care. All of the stand-by veggie proteins were quickly ticked off my "safe to eat" list. I couldn’t take it anymore and I turned my back on Betty. Big time. Upon my first carnivorous trip to the grocery store, I immediately realized I was clueless about meat. Never having cooked it myself spare boiling chicken breasts for a sixth grade girl scout badge, I was mystified by the butcher counter; I didn't know tenderloin from trotter. All I knew was that my years of animal-avoidance taught me better than to sink my teeth into a fast food chopped and reshaped chicken-wich. The horrors of factory farmed meats, mysterious presence of wheat gluten and high fructose corn syrup in deli slices, and warnings of cancer causing nitrates in cured bacons reminded me to not take my decision lightly. If I was going to eat meat, I had to satiate my carnal desires; to slice my knife through sizzling steaks, seared perfectly on my own stove, and trust who sold them to me. I left the store hungry but inspired. Should I take up hunting? Nah, too backwoods. Visit a slaughterhouse? Too political. Raise chickens? Too hippie. Much research followed. Perusing the New York Times, an article jumped out at me. Were butchers the new rock stars? Butchery. That's it. I needed to get my hands dirty. Living in Los Angeles, we all have zany aspirations. Any given coffee shop is pouring over with aspiring writers typing brilliant screenplays on any given afternoon. Thespians perform at tiny theaters to crowds smaller than their crew dreaming that their big break will happen opening night. Every retail store is staffed with art school grads and singer-songwriters. Still, I found my vision was a tad off-kilter and would require a journey north to San Francisco, a surprising happy meat hub, where I found the artisan butcher shop, Avedano's. Not only did the lady-owned shop provide their local customers with top-quality meats, but they also taught an amateur butchery workshop. I licked my chops and sharpened my knives. Let the adventure begin. I approached the butchery class with my usual stance-- cynical but optimistic, a spongy observer, opinionated but often overlooked. Taking a deep breath, I opened the front door. In that moment, my mind jumped back to the conversation I had with a male staff member several weeks before. "It probably goes without saying, but remember to wear something that you don't mind getting..." he tapered off. Does he say "bloody"? Would that be offensive? Disrespectful? What had I gotten myself in to? But at first glance of the shop, I was within my comfort zone. Gritty wooden shelves were stacked with pricey pastas and pestos. A small refrigerated case showcased fancy bottles of juices and natural sodas. A curved meat counter was neatly arranged with Real Meats, not the plastic-wrapped supermarket kind that beg for droopy iceberg and gluey white bread. Meats were labeled "dry aged" and seafood "sustainable" instead of "natural" followed by an asterisked FDA statement. I knew I could relax a bit. These were my people, mindful eaters who loved and respected their meats blood and all, without a touch of pretentiousness. The first to arrive, I was welcomed warmly and invited to step behind the counter. A shaggy-haired dude led me through the burrows, past a small kitchen and a musty room that looked like my dad's garage, ancient band saw and all. I entered a wood paneled side nook that begged to house cozy dinner parties for the meat elite of Northern California and was invited to sit at a long buffet table. While fantasizing about demi-glace and osso bucco, I was handed a crisp, white butcher jacket. The rest of the students followed shortly; four men nearing middle age, playfully bantering with each other about their meat conquests. A young girl poked her head into the room. "Daddy?" she chirped, "Try to bring home the pig's head, okay?" I then realized it was Father's Day. The class description stated students are taught to break down two animals, lamb and pig. Suckling pig, to be exact, a very young pig that has never been fed solid food or developed its muscles fully, a delicacy for lovers of tender meats. For us butcher students, this meant we were in for quite a sight upon walking into the meat locker. The pig had arrived from the slaughterhouse relatively intact, head and trotters still attached. Basically, full-on shock value. My nerves began to creep back. I hovered behind the dads, grateful that I had not been selected to attempt the first cut of the day. The first cut was the head; removed by dad number one and placed on a tray for his little girl. Then it was my turn. Thankfully, what was now lying on the table began to look more like dinner than pet. With the guidance of a crinkled diagram, I removed the kidneys (the only organs left by the slaughterhouse*), wiped the cavity clean, and made the first cut to divide the beast into sections. We used three tools-- a flexible boning knife, a hand saw, and a cleaver with a mallet. There didn't seem to be specific tools for specific cuts. Instead, we were instructed to use what felt comfortable and appropriate for the task we were given; an intuitive process. After my initial cut, my queasiness dissipated. The pig was portioned and put on ice for us students to have cooking fun with later. My mouth watered, anticipating strings of homemade sausages. Next up was lamb, and this time, I was first in line for cutting. 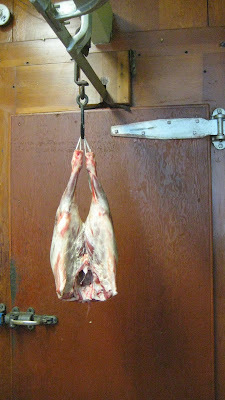 A whole lamb hung from a hook dropped from the ceiling. I was tossed a knife. The dads watched me, wide-eyed. I dug in. Split and tore off the flanks and skirts, cleaned out the cavity. Then came the fun part. The money cut. First, I made an incision through the chest, and then sliced horizontally on both sides. Next, with much guidance, I wrapped my leg and arms around the animal, squeezing it to snap the spine where I had made the cut; an awkward skinny girl straddling a lamb on a hook. I supported its weight on my leg and cut behind the spine, caught it on my knee when it dropped, and hoisted it up on the table. The dads stared. With one swift slice, I earned my new way of life. Carnivore guilt, be damned. The butchery has just begun. *Slaughterhouses remove and clean out the animals before they arrive at a butcher shop, resulting in a much less gruesome process than I imagined. Butchers actually have to purchase many of those parts back from slaughterhouses if they want to use and/or sell them.